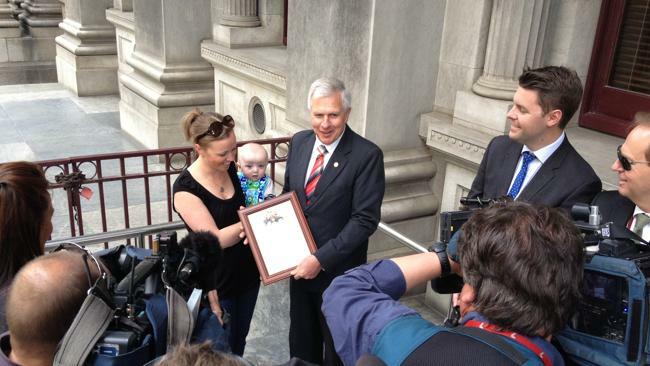 Family First MLC Robert Brokenshire has presented a certificate of commemoration to the mother of a stillborn baby after negotiating with the South Australian government to symbolically recognise the loss. Tarlia Bartch fought for a birth certificate for her 19-week stillborn son Jayden; just before his birth and death could be legally registered at 20 weeks. Mr Brokenshire put legislation before the state parliament that would allow parents to register the birth and death of a stillborn prior to 20 weeks' gestation. After 20 months of campaigning and negotiations with Attorney-General John Rau, parents of stillborn children between 12 and 19 weeks can now apply for a "commemorative" certificate from the Births, Deaths and Marriages office to recognise their child. The certificate however states that it "should not be used for official purposes" as it is not issued under the Births, Deaths and Marriages Registration Act 1996. For this reason, Mr Brokenshire will keep his legislation on the parliament's agenda for debate. The Jayden's Law campaign run by Mr Brokenshire - named after Ms Bartch's stillborn child - attracted support from thousands of people on Facebook. The move follows the introduction of a bill in the New South Wales Parliament that would amend the Crime Act and recognise the separate existence of the foetus of a pregnant woman. The bill has been named in memory of Zoe Donegan who died after her pregnant mother was hit by a van on the NSW Central Coast on Christmas Day 2009. Zoe’s law would not apply to anything done in the course of a medical procedure. It also would not apply if the child’s mother has given consent for an abortion. Visit this news story for more information.